Utility company, Eon, has launched a Europe-wide electric mobility initiative, including ultra-fast workplace charging points and a network enabling EV drivers to get from the UK to Romania by 2020. The network will include 150kW ultra-fast chargers. 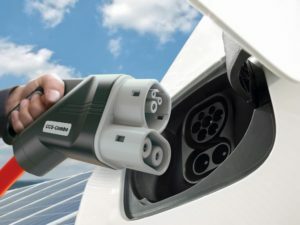 The pan-European charging network will include 10,000 units offering a mixture of charging speeds; lower-powered chargers where people stop for longer, such as at supermarkets and train stations, and ultra-fast points offering an output of 150kW (three times faster than today’s rapid chargers) at short-stop locations. The 150kW chargers are designed to be easily upgraded to offer an output of 350kW, matching the network confirmed by a consortium of car manufacturers last week. This would enable drivers to recover around 250 miles of range in less than half an hour. Eon is also launching services combining domestic charging points with rooftop solar panels, and rapid chargers for businesses capable of charging a battery in 15 minutes, the company said. The first of its modular charging points are already in place; Eon has a collaborative project with service station operator Tank & Rast in Germany, and a partnership with the CLEVER charging network which has sites in Norway and Denmark. Anthony Ainsworth, global head of marketing at eon, said: “Our aim is clear, to remove the perceived barriers of electric vehicles to really help improve the electric future for our customers. We are doing this by developing a growing network of charging points throughout Europe; whether at home, at work or on the go, from the city to the mountains.